Baptism of Atanase, son of Louise Jardelat and Etienne le Vasseur, 30 December 1796. Atanase was born 3 July 1796 at Arkansas Post on the Arkansas River near where it meets the Mississippi. His godmother, Charlotte Jardelat Reynes signs her name to the document. She and her sisters Louise, mother of Atanase, and Marie Louise sign their names to several documents but their parents and brothers do not. It was noted in other baptismal records that their parents, Pierre Jardelat and Marie Languedoc, could not sign their names. Where the daughters learned to write is not known. Friday, the 30th of December of the year 1796, I Don Pedro Janin, priest in charge of this parish district of Arkansas for His Most Illustrious Holiness, baptised and anointed with the other oils a child who was born the 3rd of July, the legitimate son of Estevan le Vasseur and Luisa Jardelas, both residents of this parish district; the paternal grandfather and grandmother are Stanilas le Vasseur and Theresa, deceased; the maternal grandmother Maria Languedoc; and on that child I administered the ceremonies and prayers and I put for a name Atanase. The godfather, Pedro Jardelas, maternal grandfather of the child, and the godmother, Charlotte, wife of Joseph Renes. 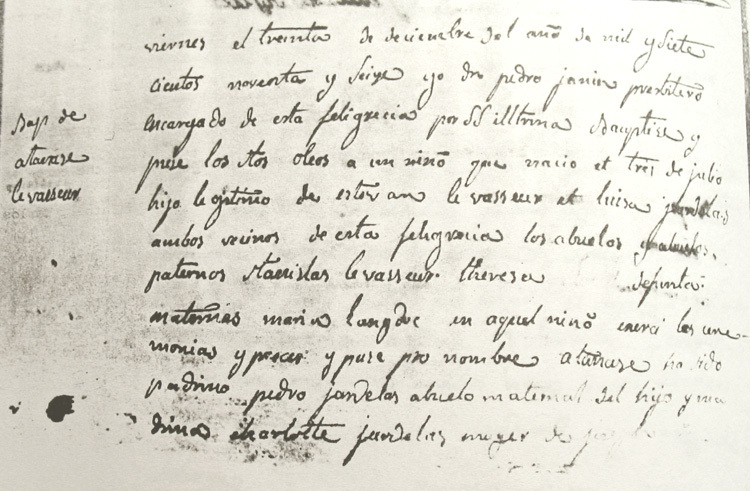 One can see the difficulty of transcribing and translating the old records, which were in French and Spanish, fragile and sometimes torn or too faint to read. Names were not spelled consistently and when the Spanish took over the area the names were written in their Spanish variants. So the grandparents, Pierre and Marie, became Pedro and Maria. The copy of the original document and the translation and transcription are from A Baptismal Record of the Parishes along the Arkansas River, Aug. 5, 1796 - July 16, 1802. Pine Bluff, Jefferson Co. Historical Society, 1982.